Love transcends the harsh realities of war and prejudice in this sweeping Pulitzer Prize-winning tale centered around two unlikely love affairs. 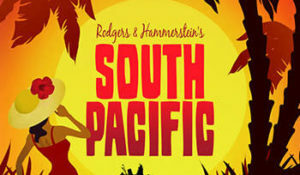 Set on a tropical island during World War II, this timeless Rodgers and Hammerstein classic features some of the most beautiful music ever composed woven into an inspiring story cherished the world over. The beloved score’s songs include “Some Enchanted Evening,” “I’m Gonna Wash That Man Right Outa My Hair,” and “There is Nothin’ Like a Dame” amidst big, Broadway performances and a chorus of American sailors and Navy nurses ready to take you to Bali Ha’i.